Oh, vampires, how I miss what you were always intended to be! Not sparkling, pre-teen swoon inducing, watered down, brooding dreams cursed with immortality, but rather blood-sucking, virulent fiends whose savagery is matched only by their thirst. That’s right, if you are looking for a gore-soaked, vampire-filled good time, look no further than Mick Ridgewell’s Evil Never Dies. “Only the good die young. Back in the Spring of 1912, evil blossomed in Kings Shore. Vampire demons with a vicious thirst for blood. Network newsman Roland Millhouse has low expectations for his current assignment. He is to interview Patricia Owens on her 120th birthday. He envisions a feeble old woman in a wheelchair. He encounters someone with more energy than most people a half century younger. A woman with a gruesome story to tell, and a need to tell it. Roland went to Kings Shore to get a quote and some photos. What he got was a terrifying tale of death and monsters. A tale that would change his life forever.” (Amazon.com). From such a simple premise, comes an amazing tale of a horrific summer. Although we only ever really “meet” two characters, we become quickly attached to them as they set about their trek into the past together. One has lived through it all and the other will come to feel like he has. Although the protagonist, Roland, starts off understandably skeptical of the tale he is being asked to hear, we are drawn in along with him as Patricia Owens shares the story of the most horrific summer of her, and just about anyone else’s life. Although we know what is coming from clues sprinkled throughout the opening part of the book, we still cannot help but shudder and fear as Patricia relives her personal hell. Ridgewell’s writing is very tight and fast paced. His descriptions are brutal but concise, giving us just enough and then leaving the rest to our imaginations. Sight, sound, smell, even taste at times, Ridgewell leaves no sense unviolated during the journey upon which his story takes us. So intense is the story telling that, even though we know Patricia will come through since she is the one telling the story, it is easy to find oneself fearing even for her in a series of events during which no one seems safe. The build-up throughout the story is amazing and does not disappoint at the end. If Evil Never Dies is a good example of what to expect from the writing of Mick Ridgewell, then I will definitely be reading anything else that bears his name. 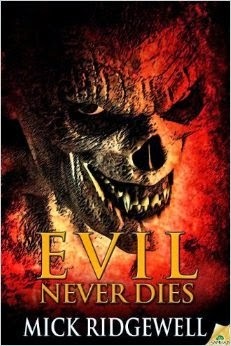 Evil Never Dies was a masterful mix of horror, suspense, and action. Ridgewell wastes no time getting right to the action while not sacrificing character development so that we can be invested in the tale when things start to get intense. If you have not read this and you are a fan of what vampires should be, you are doing yourself a great disservice and should immediately read this novel! Overall Rage Score – 4.8 – I need to state it again, if you are a vampire fan, if you consider yourself a horror fan at all, READ THIS BOOK!